From early on Cornelius Van Wright and Ying-Hwa Hu had a few differences. He was an African-American and native New Yorker; she was born and raised in Taiwan. He was trained in the commercial arts; she was a fine artist. But they put their differences aside and learned from each other. Since then they’ve made beautiful art together, and have illustrated dozens of picture books for children. A few of the titles they’ve illustrated include Alicia’s Happy Day/ El Dia Mas Feliz De Alicia (Star Bright Books, Inc., 2007); American Slave, American Hero: York of the Lewis And Clark Expedition (Calkins Creek Books, 2006); I Told You I Can Play! (Just Us Books, 2006); The Legend of Freedom Hill (Lee & Low Books, 2003); Jingle Dancer (HarperCollins, 2000); Zora Hurston and the Chinaberry Tree (Lee & Low Books, 1994). A truly multicultural portfolio of books. Don: Tell us about Princess Grace. 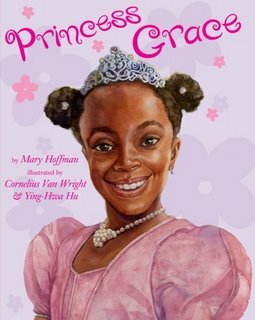 Corneilus: Princess Grace is a third picture book installment about a girl named Grace (Amazing Grace and Grace and Family were the first two books) by author Mary Hoffman. In Princess Grace we find that two girls from Grace’s class will be selected as princesses in the town parade. A question arises as Grace and her friends imagine what they would wear if chosen princess. What do princesses look like and what do they do? They find that princesses are not like the ones pictured in fairy tales. In reality there were princesses from around the world that did more then floated pretty in a pink gown (not that there’s anything wrong with floating pretty in a pink gown). Don: I can’t imagine illustrating a book together with another artist (particularly my wife). Can you talk about that process a bit? Corneilus: My wife Ying-Hwa Hu is an illustrator also. Some projects we work on individually and some we work on together. On the book Princess Grace we worked as a team. When we work as a team we try to go with our strengths. I usually start the process of breaking down the story (manuscript) into scenes and creating thumbnails (little black and white sketches to convey what is going on in the scene) to present to the publisher. After the thumbnails are approved we both start researching for references for sketches. I usually start the initial drawings, and then Ying-Hwa takes it. . Her abilities in drawing proportions are more accurate then mine, so she sometimes redraws what she feels is not working or can be improved. The same is true with the final painting stage. However when we have a project that’s going to be in black and white, Ying-Hwa takes over all the finished art. A black and white final product will be far better off in her hands. Don: What are the challenges and rewards of creating illustrations with Ying-Hwa? Corneilus: There are great challenges as well as great rewards in illustrating together. First it takes a lot of trust to hand over something you’ve been working on to someone else. It took a long time to be able to do this. Sometimes we see things (visually) differently. But I’ve learned through the years that Ying-Hwa’s eye for proportions are very accurate. So I am comfortable if she tells me something is off, to let her take it and do it correctly. Whether she has the assignment or I or both of us are working on a job, it is nice to have another set of eyes to bounce things off of. Don: How did you and Ying-Hwa become involved in the project? Corneilus: We became involved in Princess Grace because of another book we illustrated by the same author (Mary Hoffman) for book publisher Frances Lincoln, An Angel Just Like Me. Caroline Binch, the illustrator of the first two Grace books was not available to illustrate a third book. So the publisher asked if we would do a sample painting of Grace and her grandmother for consideration to illustrate the third book. Though they approved the art work, it took almost three years for the manuscript to be finalized and sent to us. Don: Can you talk about the challenges in maintaining the look of the character from previous books. Corneilus: The greatest single challenge to illustrating Grace was trying to stay true to the original image of Grace. We had no photo references of the girl who originally modeled for Grace. Because the paintings for the original Amazing Grace were realistic, there was no getting around having to get a real person to model for Princess Grace. However try as we may, we could not find anyone who looked like Grace. So we took pictures of a girl and tried to modify our drawings of the girl to at least be in the same ballpark as the image of Grace in the original book. This was really a challenge, especially when you have to do thirty two pages of a person you really don’t have references of. We also wanted to stay close to the spirit of the original book, although Grace was suppose to be a little older than she was in the first book. Fortunately most of the book critics understood the challenge and remarked on it, Stating that we chose right in trying to respect what was done before yet not try to make an exact copy. Of course most critics does not mean all critics…you can’t please everyone. Don: Do you work from photos, memory, live models? Corneilus: We work from photos, models and memory. Today we really use photos only as a springboard. We are moving further and further away from straight photo references using more imagination to alter what’s in front of us. Don: How did you become interested in illustrating for children, how did you get into the field? Corneilus: I don’t know why but I have always been in the children’s field even when I was in advertising (my first adult job). I always watched children’s programs (especially those on Public Broadcasting) throughout my college years and beyond. To diversify my portfolio, I took a course in painting Romance Gothic novel book covers. After taking that course, I knew I had to go back to the children’s world, where it was much more imaginative and I could illustrate kids of all sizes shapes and colors. Though I was working in advertising, I knew I wanted to be an illustrator and majored in illustration in college. My portfolio had lots of images geared towards children, so during my lunch breaks I would pound the pavement and show my work to publishers who published for children. All my weekends and holiday time was spent working on what ever jobs I landed. First, lots of magazine work then I got my first book cover assignment. That opened the door (in time) to books. Corneilus: My new mission as an artist (as of a year and a half ago) is to allow the images that are buried deep inside of me to come out and see where they will lead me. Corneilus: My primary medium is watercolor, though I started out as an oil painter. Don: What inspires you as an illustrator? Corneilus: What inspires me as an illustrator changes from project to project. When things are ideal (it sometimes happens) I am so captured by the topic, story and or characters that I enter a ‘zone’ of the painting and just thoroughly enjoy getting lost in the process. Admittedly though sometimes the topic or story does not inspire, and so looking at my electric bill will have to suffice in getting me up and running (only kidding). Sometimes I have to look deep and find that bit of inspiration that may be buried in the story or perhaps, historical event. Corneilus: It typically takes between 6 weeks (for a rush job), to 8 months to complete a 32 page picture book from thumbnails to finish. Balancing work, family and other things of life has always been an elusive goal. But I think it’s getting better. Don: Do you visit schools, and can you speak a bit about your program? Corneilus: My wife and I have visited schools and libraries. We usually describe to those attending how we illustrate a picture book. First showing what a manuscript looks like, to breaking down stories and creating thumbnails. We also show sketches and what a revision is like (do over). Finally we show the finished paintings and the printed books. We answer any questions on what it’s like doing a picture book. Don: What are your interest/hobbies beyond art? Corneilus: My number one life long hobby is listening to music and learning about the different machines that reproduce and record music. I also collect recorded music, some of which comes from around the world. Don: What were some of your favorite books as a child? Corneilus: Some of my favorite picture books I had (and still have) were Golden Books my mother bought me when I was little. Sparky the Little Train Engine. The Hat that Mother Made. Later my first chapter books Space Eagle, Henry Higgins and the Paper Route and many others. I keep them on my bookshelf. Don: Your books are truly multicultural. Can you talk about how you’ve been able to achieve such diversity in your work? Corneilus: My wife and I had the privilege to illustrate stories from many different cultures. We have illustrated stories of Chinese Americans, Chinese from Mainland China, Native Americans, African American, Koreans, The Middle East, and more. We believe the editors we worked with saw that part of our process was to really do our homework investigating the culture we were illustrating. We would always find friends and neighbors we knew (or got to know) from the culture we were illustrating to find out or confirm whatever questions we may have had about any given topic, clothing or custom dealing with that culture. That’s one of the advantages of living in New York, it is truly a melting pot of cultures. Don: Who are your cheerleaders, those who cheer loudest for you along the way? Corneilus: My wife and I cheer each other on. Our children sometimes surprise us by asking if they can have a particular piece of art when it comes back from printing. That makes us feel good. Don: What advice can you offer to aspiring illustrators of children’s books. Corneilus: Advice for aspiring illustrators of children’s books? Love illustrating for children from your inside. This calling from the inside is what keeps you going. Be flexible and persistent. Don: What can your fans look forward to in the future? Corneilus: I am looking to do more imaginative art. I ask God to help me see inside more. To that end, in a way I am starting over, to find out what’s really inside me. I’m curious myself. Read an interview with Corneilus Van Wright and Ying-Hwa Hu at the website of author Cynthia Leitich Smith. I read Princess Grace and it’s a lovely story. Yet another amazing couple of people who can actually work together — I stand in awe. I also very much love the fact that Mr. Van Wright took a class to learn to paint for romance novel covers. That’s got to be excellent training for just about anything — ! I appreciate this glimpse into another artist’s unique life. I really like the York book and I look forward to reading Princess Grace. What great teamwork! 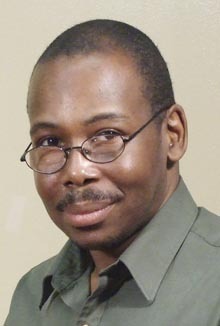 I have been looking for an African American author to study for Black History month and I came across your name. I am from NYC and I wonder if there is any relation to my husband…. Your work is wonderful. I am currently reading Ruby Bridges to my class (1st grade, and your illustarions are wonderful.